Solar installations are rising and the cost of solar panels is dropping. This is good news – right? Yes! However, solar can still be very expensive if you are planning to run a traditionally sized home. Check out our tips to help you get going. This article is going to focus on using solar on a small scale. Maybe you just want to have some backup plans for an emergency. Or you have a vacation cabin in the woods and you want a few more comforts of home. Are you on a budget? Solar works well for a do it yourself (DIY) project. You can easily add on and increase your solar power. In fact, many people choose to slowly convert from conventional power to alternative power. There are many small solar “hacks” that can be used to make your life easier. Many of the products below work great if you are looking for some backup power, want to switch over one room at a time or are on a budget and are adding solar slowly. I have built two off-grid cabins. Both times I did not have the money to install a full set of solar panels. In addition, we were building the homes ourselves and a roof was not readily available in the beginning. Solar is great because you can add on, increase your power and combine it with other sources such as a generator or wind. Below are several ideas and system for getting started. They go from simplest to more complicated. These lanterns are great for lighting a small area such as the dining room table or tucking a child into bed. The other advantage is that they are portable and it is not dangerous for children to carry around. I let my young children use them to read in bed. I would just have to check to make sure they did not fall asleep with them on. I have gone through at least ten in the past 25+ years. They are rugged, however, if you are like me they will suffer through being dropped, knocked over by goats or abused in general. They typically have a rechargeable battery which recharges in the sun or via a cars cigarette lighter. The newer ones tend to only come with the household plug in addition to a USB port. Which means a cigarette adapter if you want to use your car to recharge. I would also plug mine into the generator when it was on for power tool use. We also tried both lamp oil and kerosene lanterns which were smelly and did not provide the safety level I wanted. I needed something I could take to the barn and set down to check on animals or do the milking in winter. In addition, I wanted my children to be able to carry the lantern safely to bed or to do chores. If you have not discovered the Lehman’s Hardware website or catalog it is well worth a look see. While I am not a big fan of oil lamps, they carry the Aladdin Lamps which are excellent quality and very bright. The Amish use them in their homes. Once we started getting roof underway a very economical light is the hanging solar lamp. These do not produce a lot of lumens either. A lumen is how light is measured. A 60-watt bulb averages 800 lumens. They also do not have long life spans. My experience is they last about two years when using on a regular basis. Although, I do have a Nature Power one that is working after five years. Keep in mind that when you mount them you do make a hole in roof or wall so choose somewhere that won’t be prone to leakage. In addition use roofing sealant around the hole. These lamps are good for area lighting. I put one over the dining room table and one over the kitchen counter. They are adequate to make dinner and dine under. If you are sitting directly below them they provide enough light to read or play a board game. The advantage of the hanging lamp is that the light is over you and casts a bigger area. They work well also for emergency or vacation cabin lighting. 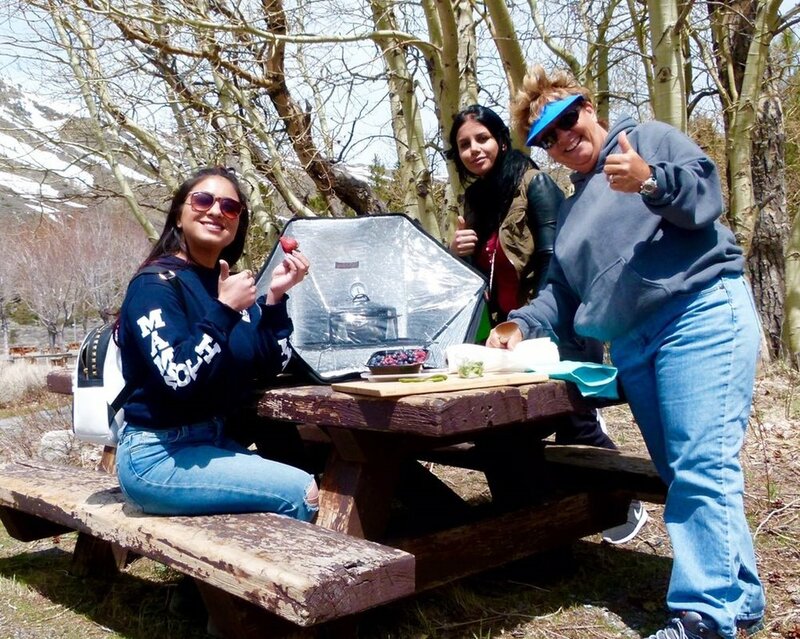 Solar ovens are a great way to save energy and to provide wonderful meals for your family. Solar ovens can be purchased or homemade. They make a fabulous science project. Many people do not realize how much energy an electric oven consumes. It’s not something that works well on solar energy. Many people opt for gas (propane) stoves when living off the grid. But this also ties you to a fossil fuel and costs money. You may not realize how hot a solar oven can get. Up to 285 degrees Fahrenheit. You can literally roast meats, boil water, bake bread and dehydrate vegetables and fruit in them. Solar ovens are lightweight (The Sunflair model only weighs a little over a pound) and they are easy to transport and set up. I use ours at home and when I’m camping). Sunflair Ovens are great for cooking! Also, YouTube has some great videos for building a solar oven. This video is a unique method on design for a solar oven. It is a bit hard to watch as he does not have a steady camera hold however, I like the way he uses the solar reflective blanket in his design. Micro solar systems are designed to do one or maybe two tasks. A good example of these are the solar cell phone and laptop chargers. They are small and inexpensive. They are nice to have on camping trips or a weekend in the cabin. However, they are not very practical for long term or day to day use. They are nice because they do not use heavy batteries and are fairly compact. Smaller batteries do mean less power so don’t expect too much from them. There are many small solar systems that can do a variety of small applications. These systems are much more versatile and can be used in a greater number of applications. Do be careful when looking at small systems. Design is very important. Read the reviews and make sure the system is sized for what you want it to do. A monocrystalline array is generally more efficient than a polycrystalline array and will give you more bang for your buck. The first system I purchased was one of those kits with a solar panel and then a variety of cords to connect for different applications. The one I was using had two battery alligator clips which attached to a small battery. I was running a modem and a laptop. The problem with the system was that the wires were not adequate for the system and became very hot and burned out. Scary considering it could have caused a fire. Take away - look for wires with appropriate gauge for the system and secure connections. Many less expensive models offer connections that are nickel plated. These will work but not nearly as well as copper. Many of the system made for RV and Marine applications work well on cabins for full time or occasional use. Small solar kits start to get into multiple components. There are often several steps required to put your system together. It is easy to run a couple lights and a small appliance on these systems. You will need to know how many watts you are producing and how much power you need. I really like the Goal Zero products which are available on Amazon and in camping stores such as REI. Goal Zero products are great because they are easy to use and many models are very portable. Ame Vanorio is a freelance writer and the director of Fox Run Environmental Education Center where she teaches classes on alternative energy, organic gardening and wildlife conservation. Ame has 25+ years of off grid living.